VEGREVILLE, ALBERTA (August 14th, 2018) – TerraVest Industries Inc., formerly TerraVest Capital Inc., (TSX: TVK) (“TerraVest” or the “Company”) announces its results for the third quarter ended June 30, 2018. The Company’s financial results for the third quarter of fiscal 2018 represent an improvement over the third quarter of fiscal 2017. Management believes that there are certain non‐IFRS financial measures that can be used to assist shareholders in determining the performance of the Company. 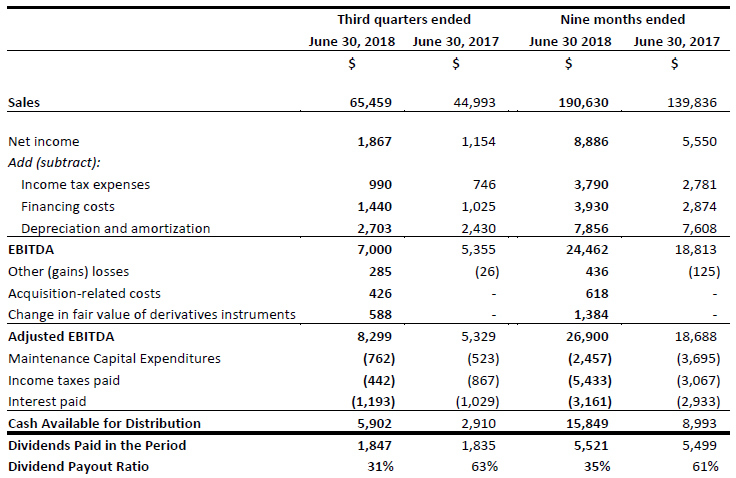 The table below highlights certain financial results and reconciles net income to EBITDA, EBITDA to Adjusted EBITDA and Adjusted EBITDA to Cash Available for Distribution for the third quarter and the nine months ended June 30, 2018 and the comparative periods in fiscal 2017. Sales for the quarter were $65,459 compared to $44,993 for the prior comparable period representing an increase of 45%. This increase primarily results from the additions of MaXfield Group Inc. (“MaXfield”) and Fischer Tanks LLC (“Fischer Tanks”), which did not contribute in the prior comparable period, as well as increased demand for most of Fuel Containment’s product lines. Adjusted EBITDA for the quarter was $8,299, which represents an increase of 56% versus the prior comparable quarter. This increase is a result of positive contributions from MaXfield and Fischer Tanks, and increased volume across many of Fuel Containment’s product lines, partially offset by customer delays affecting profitability in the Processing Equipment segment. In reconciling EBITDA to Adjusted EBITDA, one-time restructuring costs of $426 associated with the acquisition of MaXfield have been added back. Maintenance Capital Expenditures were $762 for the quarter versus $523 for the prior comparable period. This increase is largely due to timing of required capital projects, which can vary from quarter to quarter. During the period, the Company’s total purchase of property, plant and equipment were $4,043 of which $3,281 is considered growth capital. This growth capital includes additions to the Company’s rental equipment fleet, as well as manufacturing equipment to support capacity expansions and process improvements in several of its businesses. Cash Available for Distribution increased 103% over the prior comparable period. This increase is due to the additions of MaXfield and Fischer Tanks, as well as better operating results in the Fuel Containment segment. The Fuel Containment segment continues to experience increased levels of demand this year for its products and management continues to expect fiscal 2018 to be a stronger year than prior. Output during the quarter for certain propane storage products was negatively impacted due to logistical issues, but this impact is only temporary as backlogs remain strong. Management continues to expect that fiscal 2018 will also be a stronger year than fiscal 2017 for the Processing Equipment segment. Backlogs remain higher than the previous year and management is expecting positive contributions from the recent acquisition of MaXfield. There continues to be a divergence between oil and natural gas pricing which is having a varying effect on this segment’s customer base. The outlook for the Service segment is not materially different than the prior year. Pricing pressure has been a major challenge for this segment. Management is optimistic that the increase in oil prices will bring higher rates for its service rigs, as many of this segment’s customers are oil producers. However, increasing operating expenses and labour challenges could mitigate the benefits. Global steel prices and supply constraints continue to be a challenge for the Company as a whole. More recently, the import tariffs imposed by the Canadian government and deteriorating trade relations have added an additional level of uncertainty around access to raw materials. Management is expecting this to have a negative impact on the Company moving forward. TerraVest is also pleased to announce that The Board of Directors has declared its quarterly dividend of 10 cents per Common share payable on October 8, 2018 to shareholders of record as at the close of business on September 28, 2018. The ex-dividend date is September 26, 2018. The dividend is designated an “eligible dividend” for Canadian income tax purposes.